Prominent banker Mizinga Melu has appointed Barclays Bank Zambia Managing Director. 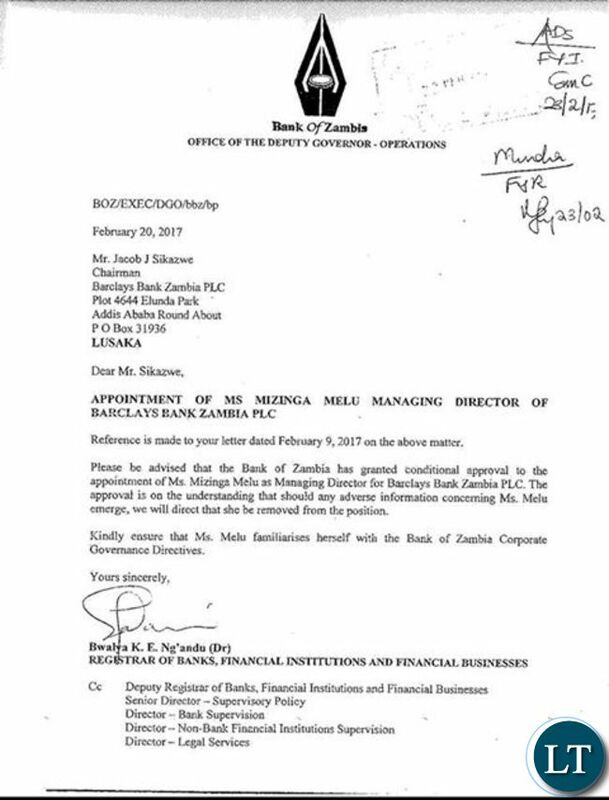 This is according to a letter from the Bank of Zambia granting conditional approval to Barclays Bank Zambia to hire Mrs Melu. She has been based in Johannesburg, South Africa after being appointed on 1st October 2014 where she was responsible for the group’s businesses outside of South Africa. Country Managing Directors of all Barclays Africa’s businesses outside South Africa were report to Mrs Melu. Before that she ran Standard Chartered Bank Zambia before heading trekking to Tanzania as Managing Director for the National Bank of Commerce (NBC). You always make us proud. All the best. How can this be a promotion ….from a Groups Director down to Managing Director…lets be serious with our news!!! I dont like her, who is she? May we help pray for our dear sister (MUSHOTA) to wake up from hallucination. Her comments are cause for worry……. Ba LT ici sungu twa papata. ‘Prominent banker Mizinga Melu has appointed Barclays Bank Zambia Managing Director’. ‘Country Managing Directors of all Barclays Africa’s businesses outside South Africa were report to Mrs Melu’. Which schools did you go to ba LT? Right on, I couldn’t believe it !!! Just reading the first sentence, O.M.G. Exactly those sentences you have highlighted above. Do they have proofreaders at LT, or its the same bunch of writers and proofreader making it difficult to identify such grammatical errors? I have offered LT proof reading service for FREE. Not heard from them. The offer still on. I wonder how an obvious demotion can make you proud. MDs outside South Africa were reporting to her.Now she will be reporting to her former office. Margaret Mwanakatwe & Mizinga Melu at BBZ & SCZ respectively were some of the women I pointed my daughter to look up to as role models of what a high flying woman should be. But ever since Maggie became Mayela she’s lost some of that corporate savvy. Don’t fall in the same trap Mizinga. Hold the loft high. Congrats & welcome back home. Zambia needs all her best brains. Listening to BBC outlook on Thokozile, the fighter pilot, I didn’t agree with reporter Gondwe that Zambia is conservative where women sit at home looking after the family. We have some of the brightest women on the continent that need our support if this country is to develop further. @west point & others, in spite of LT reporting, why not look at it this way. She was reading reports, now she will be running a bank. Maybe where her skills are needed most. BBZ has been losing clients especially in the retail banking. Bamucinga Melu. This is a demotion. What kind of English is this Ba LT naimwe? Simple news story twisted like offals – yaba! Imagine!!! Ninshi they don’t have editors? Naine napapa! why not write just in a local language? I equally couldn’t believe the grammar…yaba Africa twasebana! What’s so great about a demotion? Patience pays, thank you madam. Wishing God’s guidance in your day to day undertakings. She had no controlling authority – she provided oversight of banks outside SA. Now she will be fully in charge of BBZ – controlling officer. Also, maybe the perks are higher in this position, who knows. 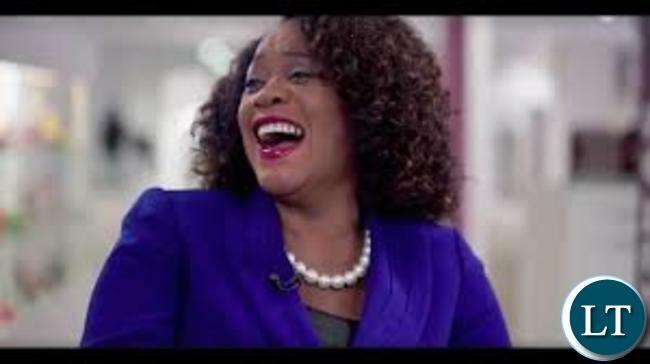 She has the experience and intelligence to tell what is a demotion or a promotion! Welcome back home mama!Wishing you all the best! Mizinga Melu’s career trajectory has been very similar to that of Margaret Mwanakatwe. I just hope she won’t be tempted to also enter politics eventually. There are other ways in which one can serve his/her nation without necessarily holding public office. Also worth mentioning that her move does somewhat sound like a demotion if all Barclays operations outside of South Africa were reporting to her and now she has come to Head Barclays Zambia. I guess this is as a result of the restructuring of the Barclays group with the African operations being sold of by the main Barclays group. It is inevitable that some individuals would be adversely affected through no fault of their own. @ 8 Farmer:….Exactly my thought. All MDs out side South Africa were reporting to her….but now she will be reporting to her successor..! Hard working woman though..! All the best..! My message to pf politicians: “TOUCH NOT MY ANNOINTED ONE”. DON’T CORRUPT HER AND SPOIL HER CAREER WHICH SHE BUILT OVER THE YEARS. MY SISTER, YOU ARE MY MODEL AND PROUD OF YOU. MAY THE ALMIGHTY GOD BLESS YOU ALL THE DAYS OF YOUR LIFE. It’s a kind of demotion, and that’s why even the appointment as Zambia’s BBZ MD is conditional. Should she be found wanting upon further investigations she will also forfeit this new position. But all the same, I have great respect for this marvelous lady; she has made the whole world proud and she is still making glorious achievements. God bless this wonderful lady. Kikiki Zambians are so docile at times that they will congratulate and envy even a demotion. Clearly the lady was not performing to standards hence been brought back to manage Zambia barclays because they know to.give rejects to Zambia just like pf was rejected but now Zambians are letting them rule illegally l.
NEZ everything for you is political, I wonder how you became best blogger. Barclays is restructuring the Barclays Africa is being Split as Barclays main is selling of its Africa and middle east operations, Hence South Africa and others are being made independent in fact we may see ABSA coming in.so There is no position remaining for Mzinginga hence she’s been given Barclays Zambia. You may find even her salary will not change and will be at that same level she was at before. So its a strategic Move not demotion.so Spend Time researching than sitting and hoping your party comes into power. Use your valuable soche minutes and data to research responsibly. @collectivethinking and @Mya if u were close to me I could have shecked your hands.its every news to put politics let’s try to see were the point is.its not a time for campaign. PF is targeting Mizinga as it happened with Mwanakatwe the disgraced PF cadre clinging to a parliamentary lost seat. Be careful with PF PHD syndrome. Horrible English in the report. Hard to grasp anything. Congrats Tonga woman. Allow me to be tribal in a positive way. NEZ, watch your diarrhea tongue before you insult mwana wa kwenu; muzitekanya. If it was a demotion trust me she would have simply walked away. Barclays has undergone some tremendous restructuring and the Africa Group has been dismantled she had the option of walking away were am sure other financial institutions would have snapped her up. BBZ has not performed well in the group for a long time now (see group annual reports) so they have sent a trusted hand they believe can bring in a new injection of life she understands this market well and its client base so all the best she can make a difference. What are her academic credentials? Can somebody help me with that? Why not resign and start an investment bank or hedge fund as her own. LT – Please go through your reports before flooding the world with crap. Your spellings are wrong and your stories are deceptive if not mysterious. Have some quality in your work. Are you a client of some quality auditing firm in Zambia or elsewhere? It is high time your firm started to be audited in quality. Your products (stories) are a good example of a company which has the ugliest quality management system. Anyway welcome back madam Mizinga, you are a Zambian Women Mentor. Your CV is heavy! Having been MD StanChart Zambia 5 years b4 trekking to Tanzania in 2012 as MD for NBC & in 2014 becoming Group MD with Country MDs of all Barclays Africa’s businesses outside South Africa reporting to her isn’t time she retires now that her new appointment smacks of demotion? It’s just morally right that certain high positions must be held for not longer than 10 years. Self discipline demands that she paves way for others to take over. How much money does she still need to make that she cudn’t in 15 years at the helm of 3 major banks in 3 Countries? Take note most MDs are not that educated. Its mostly just 1st degree & experience. cos once employed as graduate management trainees they dread pursuing Masters for fear of being supplanted. Its only academicians that are more educated with Masters, PHDs & Professorship. So Mrs Melu it is in your best interest to leave the job for others & go back to school to earn PHD & with your vast experience u’ll still bounce back at higher level than accept a demotion! If u don’t to go back to school please go into private business or even politics but not MD Barclays equivalent to previous post MD Stanchart. My late friend used to do her when we were at school in London. Atan Shansonga, the elder brother, was Zambia’s rep to the UK. You didn’t get much from that school in London! Is this all you could post surely? Imagine someone saying that about your mother? Its a straight up demotion,and no normal thinking individual shd praise that sh*t.The white man just siad send her back to where she belongs,she is incompentent,we cannot be reporting to her. I almost lost hope of seeing this lovely woman.I can now try my luck.I love her with every fiber and drop of blood that is in me. “Prominent banker Mizinga Melu has appointed Barclays Bank Zambia Managing Director.” WHO has APPOINTED who? Great journalism! LT please try to use English. Some bloggers never cease to amaze me. For once can’t you just give credit where it is due? I think Mizinga Melu has done the womenfolk and our nation proud. As to whether it’s a demotion or what, the truth is that there is some restructuring at the bank and she will still be BBZ MD with the same conditions of service as she had in RSA. Go Mizinga! Kudos to you. It’s just a pity the likes of Mushota might never have an opportunity to meet this lady and get some mentoring. Isn’t this lady in the group of the senior women that are youth abusers. The ones that hire and shag young men that they keep on call? There is an infamous group of these cougars.